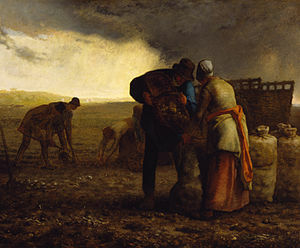 The Potato Harvest is a painting by the French artist Jean-François Millet. Jean-François Millet was raised in the area of France known as the old province of Normandy. He was brought up with hard out-of-door labor. After studying to become a painter, he devoted his art to illustrating peasants farming the land. His subjects were often taken from his surroundings or from memories from his youth. During the 1850s, Millet began incorporating his subjects into landscapes. The Potato Harvest is one of nine works which drew international acclaim at the Exposition Universelle in 1867. The Potato Harvest depicts peasants working in the plains between Barbizon and Chailly. It presents a theme representative of the peasants' struggle for survival. Millet's technique for this work incorporated paste-like pigments thickly applied over a coarsely textured canvas. Currently, The Potato Harvest is being featured in Off the Wall, an open-air exhibition on the streets of Baltimore, Maryland. A reproduction of the painting, the original is part of The Walters Art Museum collection, will be on display at Di Pasquales. The National Gallery in London began the concept of bringing art out of doors in 2007 and the Detroit Institute of Art introduced the concept in the U.S.. The Off the Wall reproductions of the Walters' paintings are done on weather-resistant vinyl and include a description of the painting and a QR code for smart phones. This page was last edited on 12 July 2018, at 11:22 (UTC).